9:19 PM, 6 Oct 2011. Finished a more thorough polar alignment after checking my meridian offset (4.5°W). 9:25 PM. Prepared the Dell laptop, John Kim-Chi, for the Lumenera software... Installed version 4.0. Connected camera to upper right USB port. There's a freaking green LED on the SKYnyx! What the hell? 10:15. Huh. That was kinda strange. Trouble finding the appropriate software. Downloaded LuCam 6.0. Looks like it will do that job. Maybe. The drift was bugging me. So I started working on the polar alignment. Redid the setup with the built-in polar scope. Then did drift alignment corrections. Then did a setting circles technique. And then repeated the polar scope process. Nothing was working! I wondered if should rework the connections so to use a separate output from the computer power supply. I grabbed a single gel battery from the cart to power the mount. Put the dew heaters back on the computer supply. Crater Bullialdue and Mare Nubium. North is down; east is right. Used LuCam Capture 6.0 (again, for camera control), 640x480, 30fps, exp 5.2 ms, gain 3.1 x, gamma 1.5. Used AmCap 9.01 to grab the video. Saved to AVI. Shot two Moon videos, in fact. I put some detailed notes on the Dell. Kinda wild! 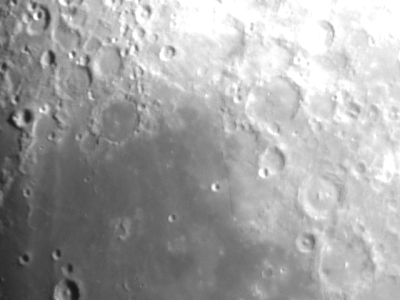 Rupes Recta just barely visible. North is down; east is right. 12:46. Checked the conditions: 72%, 10.4°C, flat pressure, rain tomorrow. 1:19. Shot Jupiter video 1. LuCam Capture 6.0 (camera control), 640x480, 60fps, exp 9.0 ms, gain 19.7 x, gamma 1.5. AmCap 9.01, AVI. 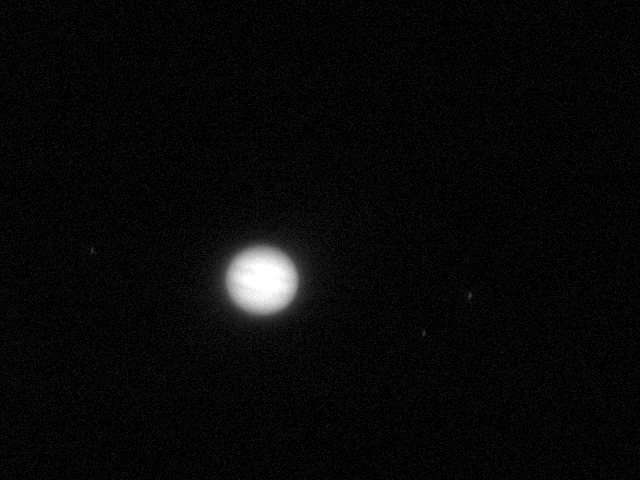 The second Jupiter attempt was not great. Became increasingly overexposed. But I could see moons! 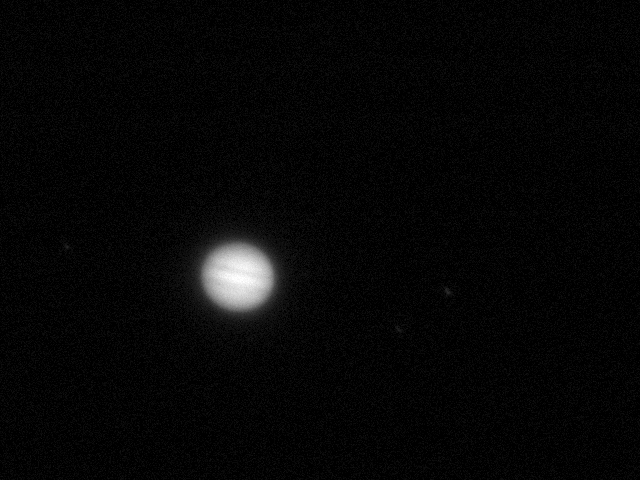 Io, Jupiter, Europa, and Ganymede. North is down; east is right. Recorded Jupiter 3 video. 60fps, exp 5.6 ms, gain 10.8 x. 1:33. Now it was 73 and 10.0. Not bad for a first go... And that was still with poor collimation! The RASC Toronto Centre has a Lumenera SKYnyx 2-0M camera. It is an easy-to-use, fast monochrome camera well suited for planetary astrophotography. The Sony sensor has 640 x 480 pixels. It supports 60 fps (without compression) with a maximum frame rate of over 100 fps (with binning and ROI). It also supports 2x2 binning. The interface is USB 2.0. We have it in a nice Pelican hard case with cable and software.